Even the base trim Jeep Cherokee Latitude sport utility vehicle has enough power to tackle steep grades in Kingsville. Car and Driver calls the Cherokee, “easier on the eyes, even easier to drive,” and U.S. News and World Report praises its “fantastic off-road abilities.” Explore our inventory today! 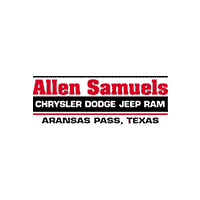 Why Buy a New Jeep Cherokee at Allen Samuels CDJR Aransas Pass? Compare the new Cherokee to the Mazda CX-5 at Allen Samuels CDJR Aransas Pass. We have a strong history of helping Port Lavaca drivers find their ideal model, and we even carry Jeep performance parts that let you customize your vehicle. Any questions? Contact us at (361) 386-2626 to find out more about our selection of custom and lifted Jeeps!